Whiskey fans in Williamson County will be able to sip on locally made bourbon for the first time since prohibition in the summer of 2015. 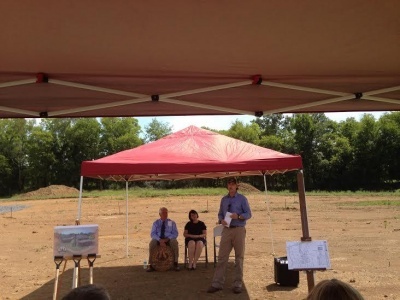 The Leiper’s Fork Distillery held a groundbreaking ceremony on Tuesday to kick off the construction project, which will be completed by late spring of next year. There is another distillery in the area but Lee Kennedy, owner of the Leiper’s Fork Distillery, said that the Thompson Station Distillery is outside of the jurisdiction of the county. Kennedy’s distillery, which has been years-in-the-making, intends to honor the rich history of the distilling spirits in Williamson County. After multiple public hearings and enthusiastic neighborhood support, the county passed legislation that would allow for the distillery. The legislation that the county passed was rigorous and Kennedy had to rethink his business plan to see if a distillery could be financially successful in spite of the regulations. The premium whiskey won’t be on the market for four years, as it will have to age. In the meantime, Kennedy said that once the distillery is open they will sell white whiskeys, wheat whiskeys and even brandy if they can find a local vineyard to partner with to supply the wine. Kennedy estimates that top-shelf whiskey will sell for around $50 – $60. A grand opening is planned for June 2015 but a date has not yet been finalized. To find out more about the Leiper’s Fork Distillery, visit their Facebook page.